For many of those in Vermont, the recent snow storm came as an unwelcome and dangerous surprise. Snow froze quickly into ice making it difficult for even those with snow tires already on their cars. For everyone else it was a wakeup call to just how severe the upcoming winter may be. Read on for helpful tips to ensure safe winter driving. 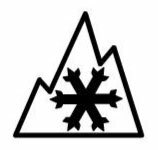 Look for this symbol when buying Winter tires. If you're looking to buy some more weather appropriate tires you may be wondering if All Season tires may be the efficient fit. If you're living in a place that gets a lot of snow and ice, like Vermont, experts warn against this seemingly cost efficient option. The primary problem is that All Season tires are meant to be adequate for all weather, and optimal for none. The tread won't be as aggressive as that on a Winter tire and the rubber used in them will not be as flexible in the cold.